International financial market is a complex inconstant mechanism. Just like a human being, it lives a life full of events. People try to analyze, predict and control it using a diverse range of instruments, brokers’ software and even intuition. Experienced traders create programs that are always close at hand like a reliable rear. They are bars or charts; each of them is unique. Graphical methods are pretty clear and easy to read, that is why many traders choose them in their work. One of the most popular is Forex point and figure software. It helps to filter out market noise and false Forex movements. Thanks to that, a trader can easily lead his strategy without drawing his attention from constant changes in price. suitability for beginners as well as advanced users. reversal (this parameter is responsible for changes in trends). The main peculiarity of p&f charts, explained in different resources, is that it is completely time-independent. But it is the reason, why many instruments do not work with this system. When traders speak about point and figure chart, MT4 is better to be installed. Only a minute-time-table is necessary. Choice of an instrument (a currency pair and so on). Closing and opening quotations from archives. Setting 40 thousands of bars. Downloading templates for the indicator. Adjustment of vertical and horizontal lines. “X” stands for a price increase, so “0” means a decline in prices. A “dot” is there to show the start of changes. 1 point is the minimal step of price (i.e. a chart registers changes only when fluctuation is more then 1 point). Points always alternate with figures. There is no particular difficulty in how to read point and figure charts. It is formed from 3 columns 0 – X – 0, when the second column of “0” falls on 1 cell lower than the previous “0”. It is formed from 3 columns X – 0 – X, when the second of “X” goes up on one cell in comparison with the previous “X”. It is formed from 4 columns X – 0 – X – 0 and is similar to S1 by its ending, but the top of the second “X” is on one cell lower than the previous “X”. It is formed from 4 columns 0 – X – 0 – X and is similar to B2 by its ending, but the second “0” column’s base is one cell higher than the previous “0”. The current “0” column is one cell lower than two previous “0”s, the tops are of no importance. Tops of two previous “X” columns are at the same level, but the top of the third “X” breaks through on 1 cell up. 2 successive S1 and / or S2, and as a consequence may be an evidence of the bearish trend. 2 successive patterns B1 and / or B2 that make a chain of ascending tops. Alike S3, but before the current “0” breaks through the horizontal level of support, the bottom of the third “0” goes one cell up. 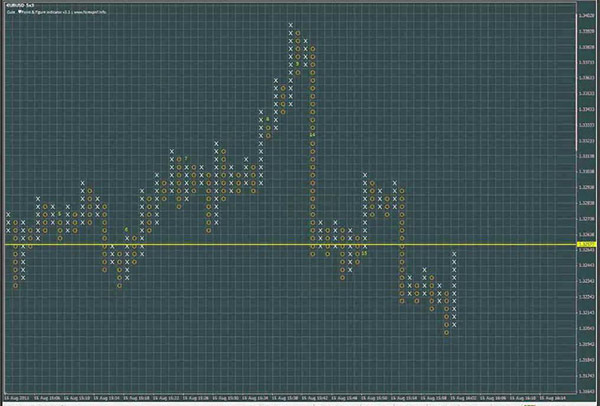 Alike B3, but the third “X” column goes one cell down before the forth “X” breaks though the horizontal resistance. To sum up, point & figure charts, free from time, is a really good assistance in Forex trading, though they also have their disadvantages. But if a trader uses several methods, p&f should be definitely among them.